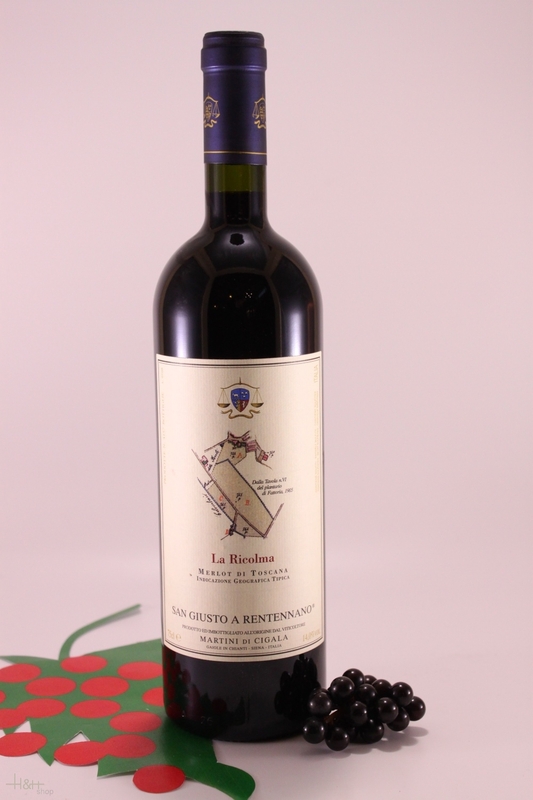 "Doctorwine" has rated the wine "San Giusto a Rentennano 'La Ricolma' Merlot Toscana IGT, Tuscany, Italy" from the vintage 2006 on 01.05.2014 with 90 of 100 points. "Falstaff Magazin" has rated the wine "San Giusto a Rentennano 'La Ricolma' Merlot Toscana IGT, Tuscany, Italy" from the vintage 2013 on 10.02.2017 with 94 of 100 points. "Wine Spectator" has rated the wine "San Giusto a Rentennano 'La Ricolma' Merlot Toscana IGT, Tuscany, Italy" from the vintage 2013 on 15.11.2016 with 93 of 100 points. "Falstaff Magazin" has rated the wine "San Giusto a Rentennano 'La Ricolma' Merlot Toscana IGT, Tuscany, Italy" from the vintage 2011 on 13.02.2015 with 95 of 100 points. "Wine Spectator" has rated the wine "San Giusto a Rentennano 'La Ricolma' Merlot Toscana IGT, Tuscany, Italy" from the vintage 2011 on 15.10.2014 with 94 of 100 points. "Vinous Antonio Galloni" has rated the wine "San Giusto a Rentennano 'La Ricolma' Merlot Toscana IGT, Tuscany, Italy" from the vintage 2011 on 01.09.2014 with 89 of 100 points. "Robert Parker The Wine Advocate" has rated the wine "San Giusto a Rentennano 'La Ricolma' Merlot Toscana IGT, Tuscany, Italy" from the vintage 2010 on 29.08.2013 with 96 of 100 points. "Vinous Antonio Galloni" has rated the wine "San Giusto a Rentennano 'La Ricolma' Merlot Toscana IGT, Tuscany, Italy" from the vintage 2010 on 01.08.2013 with 96 of 100 points. "Falstaff Magazin" has rated the wine "San Giusto a Rentennano 'La Ricolma' Merlot Toscana IGT, Tuscany, Italy" from the vintage 2009 on 15.02.2013 with 93 of 100 points. "Vinous Antonio Galloni" has rated the wine "San Giusto a Rentennano 'La Ricolma' Merlot Toscana IGT, Tuscany, Italy" from the vintage 2009 on 01.06.2012 with 94 of 100 points. "Falstaff Magazin" has rated the wine "San Giusto a Rentennano 'La Ricolma' Merlot Toscana IGT, Tuscany, Italy" from the vintage 2008 on 10.02.2012 with 94 of 100 points. "Wine Spectator" has rated the wine "San Giusto a Rentennano 'La Ricolma' Merlot Toscana IGT, Tuscany, Italy" from the vintage 2008 on 15.10.2011 with 90 of 100 points. "Robert Parker The Wine Advocate" has rated the wine "San Giusto a Rentennano 'La Ricolma' Merlot Toscana IGT, Tuscany, Italy" from the vintage 2008 on 31.08.2011 with 95 of 100 points. "Vinous Antonio Galloni" has rated the wine "San Giusto a Rentennano 'La Ricolma' Merlot Toscana IGT, Tuscany, Italy" from the vintage 2008 on 01.08.2011 with 95 of 100 points. "Falstaff Magazin" has rated the wine "San Giusto a Rentennano 'La Ricolma' Merlot Toscana IGT, Tuscany, Italy" from the vintage 2007 on 11.02.2011 with 93 of 100 points. "Robert Parker The Wine Advocate" has rated the wine "San Giusto a Rentennano 'La Ricolma' Merlot Toscana IGT, Tuscany, Italy" from the vintage 2007 on 31.10.2010 with 96 of 100 points. "Vinous Antonio Galloni" has rated the wine "San Giusto a Rentennano 'La Ricolma' Merlot Toscana IGT, Tuscany, Italy" from the vintage 2007 on 01.10.2010 with 96 of 100 points. "Falstaff Magazin" has rated the wine "San Giusto a Rentennano 'La Ricolma' Merlot Toscana IGT, Tuscany, Italy" from the vintage 2006 on 29.01.2010 with 94 of 100 points. "Vinous Antonio Galloni" has rated the wine "San Giusto a Rentennano 'La Ricolma' Merlot Toscana IGT, Tuscany, Italy" from the vintage 2005 on 01.06.2008 with 92 of 100 points. "Wine Enthusiast" has rated the wine "San Giusto a Rentennano 'La Ricolma' Merlot Toscana IGT, Tuscany, Italy" from the vintage 2004 on 04.01.2008 with 94 of 100 points. "Robert Parker The Wine Advocate" has rated the wine "San Giusto a Rentennano 'La Ricolma' Merlot Toscana IGT, Tuscany, Italy" from the vintage 2004 on 29.06.2007 with 95 of 100 points. "Falstaff Magazin" has rated the wine "San Giusto a Rentennano 'La Ricolma' Merlot Toscana IGT, Tuscany, Italy" from the vintage 2003 on 03.11.2006 with 92 of 100 points. "Falstaff Magazin" has rated the wine "San Giusto a Rentennano 'La Ricolma' Merlot Toscana IGT, Tuscany, Italy" from the vintage 2002 on 30.12.2005 with 91 of 100 points. "Falstaff Magazin" has rated the wine "San Giusto a Rentennano 'La Ricolma' Merlot Toscana IGT, Tuscany, Italy" from the vintage 2000 on 02.01.2004 with 94 of 100 points.